On 26 October 2011, the Rt.Hon. 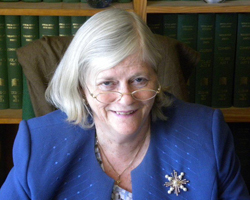 Ann Widdecombe will give the 2011 Provost Derek Hole Public Lecture entitled 'Faith and Politics'. Ann Widdecombe was Conservative MP for Maidstone from 1987 to 2010, and served as Employment Secretary, Employment Minister and Home Office Minister under John Major's administration. She is known more recently for several TV appearances, in The Widdecombe Project, Ann Widdecombe Versus and Ann Widdecombe to the Rescue, as well as a much-publicised appearance on Strictly Come Dancing.